This year we took a different route to Dunkirk: driving a coach onto Le Shuttle at Folkestone. On the train we could get off the coach and stand round chatting. It's a bit like being in a pub, except there is no drink and the room really is swaying! Several of us did miss playing chess in the bar on the boat. The speed of the crossing meant that we arrived in Dunkirk by mid-afternoon, in time for a few hours' exploration. Jez Parfett and I set off in search of the maritime museum, but were sidetracked into a bar ("Les Boucaniers") by the port which was serving Grimbergen on draught. We were welcomed at a reception at 7:30 that evening at the Centre des Arts et des Loisirs in Cappelle La Grande. Roger Gouvart, Mayor of Cappelle, in his opening speech wished us good luck but warned that the French were out for revenge this year. Our hosts were as friendly and hospitable as ever. Over a fraternal drink I began to wonder about our chances: one or two of our players were having difficulty holding their glasses steady! 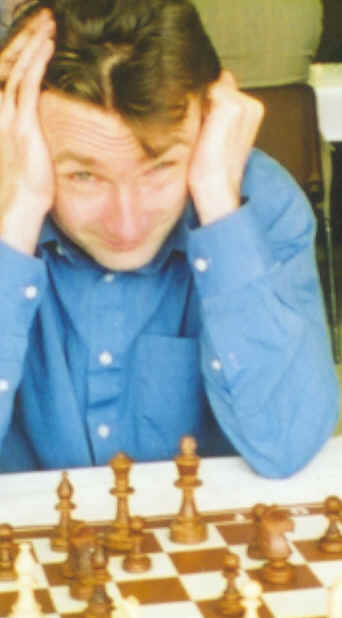 Nothing to worry about: the glasses had wide brims, so tired and emotional British chessplayers could not be expected to handle them expertly! In the main hall next door were 400 or 500 local kids at a Friday night cinema show: free for the under-10s, 10 francs for others. Also starting that weekend was a veterans' football tournament, with two British and three French teams. All these events are supported by the local council: hard to imagine from a typical UK town council! Back in Dunkirk that evening, we dispersed to local restaurants. These are generally very good and reasonably priced. Good food and drink are the main reason why some non-players in our party go on the trip, and indeed the really serious gourmets had pre-booked their table! It is traditional that we meet late in the evening at a local bar for a pre-match training session. Far fewer were open late this year, including our usual Cafe de la Banque, but the nearby Wall Street provided a good alternative. A team problem cropped up: key American player Matthew Diczok had phoned from Brussels. Having worked all day in London, he caught the Eurostar but fell asleep and missed his change at Lille. Persistence and several mobile phone calls led him to the Wall Street bar by about 12:30, in time for the remainder of the opening preparation. With determination like that, what chance did the French stand? Next day we were at Capelle for lunch, provided by the Cappelle club. The 1995 Lirac was particularly good. None of us were expecting to do very well: outgraded on most boards and missing several strong players who had made the difference last year. However, the 30-board match turned out 20.5-9.5 to us, the damage being done by our midfield players. The junior squad which forms part of our team also scored well. "Morton et Parr ne sont pas ici!" "Ils arriveront en cinq minutes" I replied, imagining them on the next bus, and play began. Five minutes later they did turn up, but had not caught the bus. They had walked all the way: 3 or 4 miles, and were rather soggy! Dunkirk spirit or what? They also got 1.5 out of the 2 possible points for their games. The morning round had 32 boards, and although the French improved their score we again won, 17.5-14.5. After another excellent lunch, at which Michel encouraged Selina to sample quantities of the Lirac (he was playing her in the afternoon! 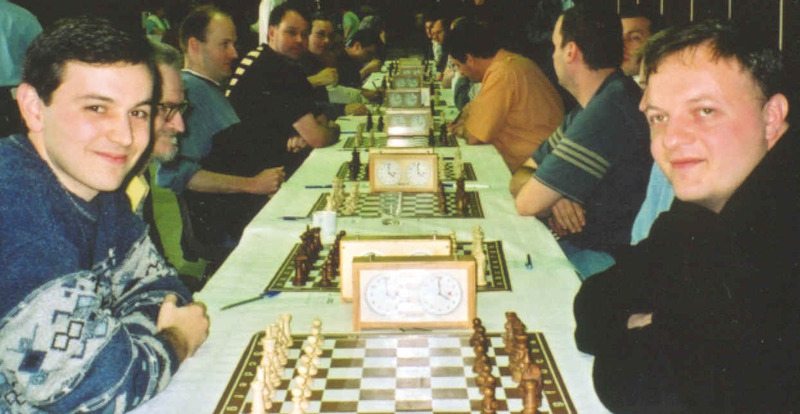 ), we settled down for the last round, again over 32 boards. Result: 18-14. Overall score 56-38 to us! 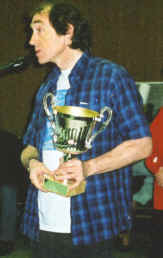 At the prizegiving the Mayor noted that the British teams had won not only the chess but also the football. Rick McMichael gave the speech of thanks to our hosts on behalf of the English team and after the final banquet the trophy started its trip back to London. Well played lads and lasses, especially those scoring 3/3! These include Les Heard, Alistair Morton and David Ross. Details should be somewhere else on the website. Thanks in particular to John McVicar, Tony Suttill and Colin Mackenzie for organising the trip, and of course to all the Cappellois for their hospitality and sportsmanship. A return match will be arranged in mid-September. If you've read this far and are still interested, have a look at the Cappelle club's superb website. They have just been promoted to the first division of the French league and next season will be fielding a team with three GMs at the top!